Whether you are an experienced tattoo artist, a skin care specialist in the aesthetics field or looking for a new job opportunity, becoming a tattoo removal technician is a great way to expand your service menu or to start a new career in the rapidly growing medical aesthetics industry! In the United States, 40 percent of adults between the ages of 18 and 69 have at least one tattoo, and not all of those tattoos are going to be keepers. This is where a professional tattoo removal technician comes in! The National Laser Institute offers a one-week tattoo removal training in Dallas for estheticians, cosmetologists and career changers looking to learn tattoo removal techniques and become a tattoo removal technician in this up-and-coming industry. Laser tattoo removal is an exciting procedure; however, few people understand the science behind the treatment. During tattoo removal training in Dallas, students will learn in-depth the tattoo removal process to remove unwanted ink. How does this laser treatment work? A handheld device sends pulses of light energy into the skin, which is absorbed by the tattoo ink. The tattoo ink particles heat up and shatter into tiny fragments. In the weeks following treatment, the body’s immune system flushes the fragmented participles away from the location, which lightens the appearance of the tattoo. Q-switched lasers have become the industry standard for laser tattoo removal treatments. Tattoo ink particles are typically nanometers in diameter, so they only need to be heated for a brief amount of time. Since a Q-switched laser pulse is brief, it can heat and shatter tiny ink particles without disturbing the surrounding skin tissue. This gives tattoo removal technicians the ability to selectively target tattoo ink particles while leaving the surrounding skin unharmed. The Q-switched laser technology we use during tattoo removal training in Dallas includes all three wavelengths (1064/755/532) to address all tattoo colors. Laser tattoo removal education is essential for anyone who wants to become a tattoo removal technician. These courses will include classroom education and hands-on laser practice for students to feel comfortable and confident in firing a cosmetic laser. The National Laser Institute offers tattoo removal training in Dallas where you’ll learn how to remove unwanted tattoos, as well as tattoo removal techniques to deliver a safe and effective treatment to your clients. Tattoo removal training in Dallas also includes hands-on laser practice in a medical spa environment. Students will have to opportunity to put their new skills to the test as they watch comprehensive laser tattoo removal demonstrations and treat scheduled clients to gain real-world experience. We are the only medical aesthetics school in the country that spends millions of dollars each year to book clients for you to work on! Are you ready to become a tattoo removal technician? Speak with an admissions advisor today to learn more about tattoo removal training in Dallas! With over a decade of excellence, our medical aesthetics courses combine didactic education and hands-on training for the ultimate learning experience. We want you to walk away feeling confident in the skills you acquire during your laser tattoo removal education. Our Just Tattoo Removal course is the most popular among students looking to become a tattoo removal technician. 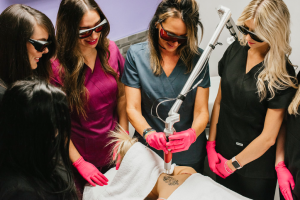 Classroom instruction provides you with in-depth knowledge of how lasers work, clinical applications, tattoo removal techniques and laser safety. Clinicals take place in a medical spa environment where you’ll watch comprehensive laser demonstrations and treat scheduled clients for a real-world experience! One of the things that make the National Laser Institute unique is we have a Graduate Services Department whose sole mission is to help you land a job after you graduate. They send out over 500 job leads a month to help you land a job! For more information on our medical aesthetics course options, fill out the form on the right or give us a call at 1-800-982-6817.